Andian Sales’ expandable barriers indicate to pedestrians that there is no way ahead due to a potential hazard. Correctly positioned Andian expanding barrier offers a safe solution for issues such as wet floors, footpath repairs, crowd control, subterranean works and access control. 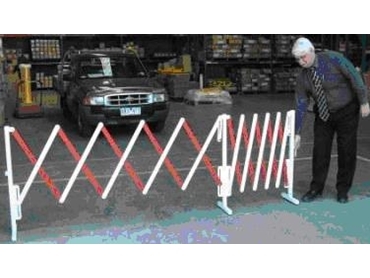 The temporary barriers are extensively used in airports, supermarkets and shopping centres. You are able to use Andian expandable barriers to limit access to factories during opening times. Andian expanding barriers are available in lightweight or heavy-duty models and easily clip together to form longer barriers. Both expandable barrier models are available in colour combinations yellow/black or red/white.